What goes together better than two peas in a pod? Why, pearls and diamonds of course! Let your new pearl pendant upgrade your look with its luminous glow of glamour. 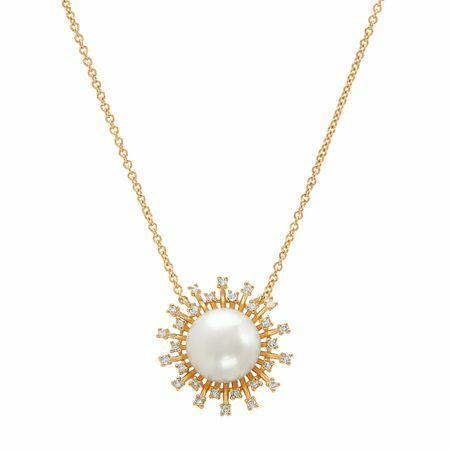 A 9-9.5 mm white freshwater button pearl is surrounded by a stunning 14K gold sunburst stage, with 1/8 ct round-cut diamonds along the spokes for extra shine. Piece measures 11/16 by 11/16 inches. Comes with a 14K gold 18-inch cable chain and features a lobster clasp.